SHEPHERD blends calligraphic expertise with a keen eye for social custom in her three-book series about civilized notes, letters, and conversations in the 21st century. WHATEVER YOU’RE THINKING or feeling, you can learn how to phrase it, when to write it, who will appreciate it, and what it means in the 21st century. Nothing nurtures relationships the way personal letters can. 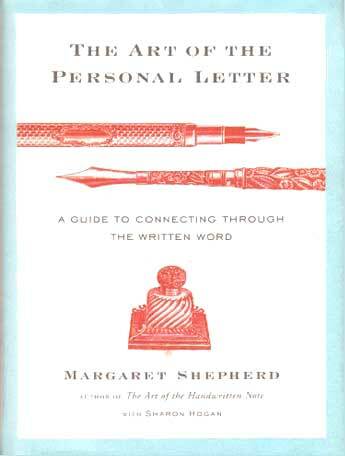 In The Art of the Personal Letter, Margaret Shepherd’s guidance includes: suggestions for improving your handwriting; whether it’s best to e-mail, print out, or hand write your letter; thoughts on softening the visual bluntness of email; 19 different sample letters for different situations including how to write a legacy letter to the future. Ms. Shepherd offers advice to help you present your words in the best light.